Question posed a while back was: who’s your preference, Mr. Fitzwilliam Darcy from Jane Austen’s Pride & Prejudice, or Mr. John Thornton from Elizabeth Gaskell’s North & South? Why the comparison? If you’ve not read the book, nor seen the 2004 BBC adaptation, you won’t know just how similar the two stories are in many ways. Both are about two proud men and women, and both are prejudiced against one another. Darcy because Lizzie is of a lower status in society than him, and the other way around; Thornton because Margaret is a Southerner who hasn’t got a clue about the runnings of a mill, and Thornton in turn is of course a Northerner who obviously isn’t as cultured and refined as they are in the South. Both stories have the men proposing to the women prematurely. He has already realised how besotted with the female protagonist he is, but she has not yet fallen for her male protagonist’s charms yet, and completely snubs him in a scene that you can’t but call cringeworthy. It’s close to physical pain to see them propose when you just know she’s going to turn on him and tell him to – in polite, 19th Century terms – eff off. There are also notable differences. Darcy is a man born with a silver spoon in his mouth (not quite sure that’s the correct expression in English, but it’ll do) – he’s wealthy, upper class and doesn’t suffer fools gladly. Thornton comes from a completely different background – he wasn’t privileged, his father killed himself after some speculations failed, and he’s had to struggle hard to get where he is now, so that today, he’s fairly well off, but he’s not on par with Darcy. There’s no extravagant family mansion and he does have to work for a living. He’s also a much more interesting character. P&P was, like I’ve already stated, my first formal introduction to period drama. While I had read and seen things in period costume before, it was the first time I realised that wow, I really like this, and “I want a Mr. Darcy too!” You know the drill. 🙂 Since then, especially now in more recent times, when I’ve been role-playing, taking courses in creative writing and started to notice things a bit more, and definitely also since reading the Brontës; I’ve realised that while I love Jane Austen’s works, they do leave a bit to be desired. Charlotte Brontë thought Jane Austen was too restrained, a bit dull, because all her characters ever do is have polite conversation with one another. There’s no real feeling there. Of course, they were from different levels in society, and the one Jane Austen belonged to was that of a more upper middle class one, where there were lots of society balls and emphasis on making a good match and all that. That was her world, it’s what she knew. The Brontës, being a parson’s daughters in a small town in Yorkshire, they saw a different side of society, one that was more passionate, because they didn’t have the same restraints on them to conform with society, or at least not in the same way. They were poorer, there were not the same pretentions. Anyway, that’s why we can say that the Brontës wrote more passionate love stories, because they were free to do so. Such were their lives. And it’s true. I do find the Brontë sisters characters more three-dimensional. They aren’t just posh blokes with a grudge on a former friend who tried to seduce their little sisters – they have a past, they have conflicted characters. Elizabeth Gaskell was a good friend and biographer of Charlotte Brontë, and she’s taken a leaf from that woman’s book, so to speak. Thornton has a life separately to Margaret, which you can’t really say for Darcy. If he wasn’t in love with Lizzie, who’d be be? A toff with a grudge on a former friend who tried to seduce his little sister. That’s all, basically. And where’s the fun in that? 18 Responses to "Darcy or Thornton? Survey says …"
I have to agree with your poll’s results! I discovered Darcy first but Thornton makes me flutter! Same here! 🙂 Darcy was #1 until I fell in love with Rochester, and since then, Darcy has slid further and further down the list. He’s a nice enough bloke, but he’s just not quite on par with Thornton. Hi Traxy, just here via Maria Grazia’ blog. Lovely blog of yours! I have to admit that I’m a recent Mr Thornton’s convert. I’ve been in love (platonically of course) with Mr Darcy aka Mr Colin Firth for years until MG got me into North and South. Now I’m totally lost for Gaskell’s hero and the gorgeous Mr Armitage. Ciao. A.
Oh god, Mr Thornton in that adaptation is so hot. I think it’s the Lancashire accent. *fans self* He’s grumpy, he’s got cheekbones you could get a papercut on, he’s wearing a cravat, he’s got a gruff Lancs accent. Hell yes. By the way – have you seen him in the Vicar of Dibley? I was also thinking – wouldn’t he make a good Rochester? Rawwwwwrrrr…..! Richard Armitage as Mr. Rochester would be a dream come true. 🙂 But I suppose we’ll just have to settle for Michael Fassbender next year instead. And indeed I have seen Vicar of Dibley. Handsome stranger indeed. 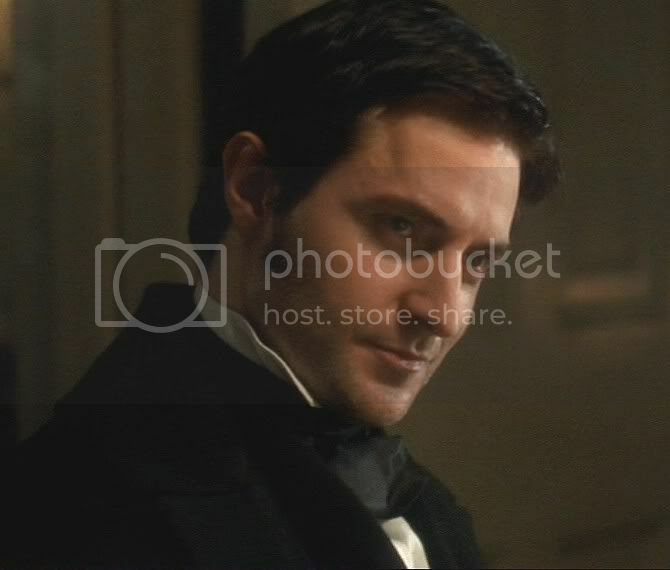 Armitage as Thornton – I can never look at a box of chocolates in the same way again! I’m so glad to be going around catching up on everyone’s blogs. This is a topic close to my heart. BNS (Before North and South) I sniffed at period drama, because my only exposure to it was P&P and Emma. These stories are so static, as much as they were witty I found it really hard to relate to any of the characters. Probably because I don’t understand what on earth they do all day! Even Elizabeth Bennet *gasp*. But then came N&S, Mr Thornton and Margaret who have full lives. Hai! Was searching for A nice pica of John Thornton, and I found this one. Well, it’s a difficult one. I think both stories are so much comparable, that is hard to make a choice. I really love mr Darcy, he is the perfect gentleman. Johnny T, has a dark side, which I also like very much. They look both very gorgeous, I can’t say I like T better than D on that point. I do know that Gaskell wrote from different point of views, Austen only from one: lizzy’s. We never know how Darcy responded and what he felt when Liz said certain things. That’s a pitty, but we can all imagine. Richard Armitage in ANYTHING .. lets be honest here!! Well, as long as they don’t get the same script writer as for the 2005 film … Who, in an interview, basically said she didn’t understand why people were so besotted with Darcy. BIG mistake. A week ago I saw N&S for the first time and I was very much surprised about its similarities with P&P and, no less surprised, about my own fading passion for Austens Darcy/BBC C.Firth in favour of the even taller and darker Mr. Thornton. Beeing not a native speaker, I almost did not understand what R.Armitage says, so I thought for myself: “at least this is a huge advantage of Darcy – I understand him when he talks”, but after four hours of Armitage I got used to that voice – and found myself admiring it. Anyway. We should not underestimate J. Austens achievements. Hers is the original story of a girl who recognizes the qualities of a man she disliked at the beginning. Mrs. Gaskell wrote a very similar story some 50 yeras later, in the time of industrial revolution (as much as I know, the first version of P&P, called First Impressions, dates about 1800); Mrs. Gaskell was already 45 years old when she wrote N&S, an age, Miss Austen didn’t even reach. Agree. I had heard a lot about N&S when I started my explorations into Armitage Admiring, but I dind’t really know what it was about. So when watching it for the first time, I too was surprised to find how similar the two stories are. 🙂 Maybe that was Gaskell’s intent, to write a more down-to-earth and modernised version of P&P? And here in our german Amazon, 101 women (and men, of course) wrote how passionately they admire this DVD and I still needed years to believe them. Unfortunately, I must admit, that I have read all of Jane Austens novels but none of Mrs. Gaskells (and I know very little about her), so I actually should not discuss her at all. I will close this gap immediately and read N&S. So far, my comparison can only be between Mr. Firth and Mr. Armitage – and here I share your opinion completely: I would´t ever think it possible, but R. Armitage wins!